Four months ago Boko Haram fighters kidnapped more than 200 girls from a school in the village of Chibok, focusing international attention on northern Nigeria's five year insurgency. In the meantime the media spotlight has moved elsewhere, but the girls are still missing. DW spoke to an activist in Abuja still campaigning vigorously for their release. DW: What sort of state is the BringBackOurGirls campaign in? Tsambido Hosea-Abana: The campaign is still there - and is graduating to a higher movement - now they are increasing other activities, distributing flyers and stickers. They have said they will never sit back until these girls are found. But it has been four months now and there's still been no word of the Chibok girls. Are people still motivated? No one expected it would take so long. We have to remind people that these girls are still there and nobody is talking about them. We have to go and talk about them! Also, some of the media have packed their things. Many media, both national and international, they are no longer coming, but we are going to visit them and invite them so that we keep on talking about these girls, so that the Ebola issue does not overpower their interests. So not so many people are focused on the story. How is this affecting the campaign in Abuja? It's affected the campaign because we need attention to gear us up but when there's no attention, people feel demoralized. People feel as if what they're doing is not important. But even from the beginning some people were not giving us attention. But even if there is less attention, we say we will continue. 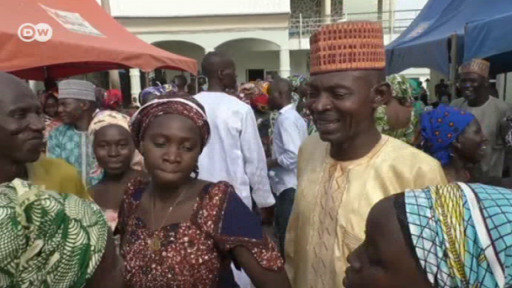 After meeting parents of the girls last month, President Goodluck Jonathan promised he would do everything in his power to free the girls. How are those parents coping now? Some are no longer in Chibok. Some have left to go somewhere else as a refuge because Chibok has been attacked and there is a rumour of more attacks on surrounding villages. People are fearing that the next community they will attack will again be Chibok. So many people have run away from Chibok now. And even some of the parents of the girls in the bush have died. Just three days ago, one father died because his house was burned and he ran away to Maiduguri to find refuge but there he couldn't cope and he died. There are many victims; things are very bad in Chibok. Tsambido Hosea-Abana is the chairman of the Chibok Association in Abuja, and a leading campaigner in the BringBackOurGirls movement. Feedback: How do you think campaigners could revive waning interest in the girls' plight? Send us an e-mail. Please include your name and country in your reply.